Many of you already know Donna Young. She became affiliated with the AAVSO in the mid-1990's when she led the effort, and was the primary author, of Hands On Astrophysics (HOA). HOA was a variable star science education curriculum developed mainly for high school audiences (but is used by some college and advanced middle school classrooms). About a decade later she updated the curriculum and renamed it Variable Star Astronomy. It is now an online document that is regularly updated and expanded. If you want to know about the science of variable stars and variable star data analysis, it is a great place for a new person to start. Donna has attended and presented talks at many AAVSO meetings is a fixture at meetings of the National Science Teacher's Association (NSTA) and has run the astronomy event for the national Science Olympiad contest for years (she often includes variable star activities in her events - providing a good introduction to VSO for high school students). She is the Lead Educator for the Chandra Observatory Education and Public Outreach office. She has worked in that capacity through Tufts University for the last few years, but has now moved to the AAVSO. She has the same position and responsibilities, and is supported by NASA, but is now part of our family. It seemed to everyone involved that the AAVSO was a better and more natural fit for her duties. She spends much of her time giving workshops at teacher conferences and designing curriculum and activities involving Chandra activities, which is includes a heavy element of stellar astrophsyics. 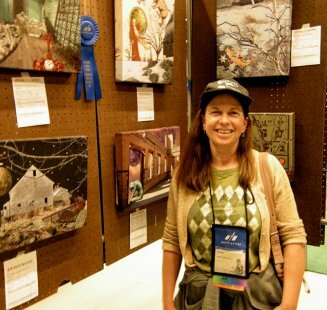 Donna is also an award winning artist and collector of vintage science fiction toys. We're very excited to have her around to help out various education-related activities and spread the word of variable stars directly to today's teachers. Click here to read more about Donna on her staff page.